The healthcare sector remains one of the fastest growing industries in Missouri, demanding an extensive number of professionally trained individuals. The current demand for healthcare workers is reflected in the number of training programs designed to produce workers to fill vacancies for entry-level positions such as certified nurse assistants and home health aides. A career as a CNA provides a rewarding start in the healthcare sector. CNAs are the eyes and ears of the healthcare team. They provide bedside care, assisting patients with personal care details, such as bathing, feed, dressing, and elimination. They also use their knowledge and skills to measure vital signs, respond to patient calls, and observe patients and report unfavorable reactions to treatments and medications to doctors and nurses. The nursing assistant class at Healthcare Education teaches students how to use their skills and compassion to provide direct patient care services. The program’s duration is 16 weeks and includes lectures in the classroom, practical learning experiences in the lab, and supervised patient care experiences in a long-term care facility. Course topics include vital signs, mental health, laws and ethics, communication and interpersonal relationships, personal hygiene, rehabilitation and restorative techniques, patient transfers, and end of life care. Tuition for the program is $800. The certified nurse assistant classes at BKA Medical Training Center prepare students for an entry-level career in the medical sector. Graduates are eligible to take the state competency exam for employment as a CNA. The training runs for 8 weeks and includes instruction in the classroom and lab, and direct patient care in a supervised clinical setting. Applicants must be 18 years or older and pass a criminal background check and TB test. A physical exam and immunization may be required for placement at the clinical site. Tuition for the program is $2,600 plus expenses for fees ($209) and supplies ($235). Flexible payment plans are available for all students. The nursing assistant program at St. Louis Community College meets the requirements of the Missouri Omnibus Act. The 175-hour curriculum is divided into 75 lecture hours and 100 hours of supervised clinical practice. For the classroom instruction, students meet twice weekly for 20 4-hour sessions. The hours for the clinical sessions vary. Course content includes fire safety, basic nursing skills, elimination, personal care, food service, resident safety and rights, restorative nursing, infection control, special procedures, and social and psychological issues. The clinical sites may require students to complete a criminal history check, drug screening, and immunization. All applicants must be at least 18 years old and submit an FCSR worker letter at the time of application. Tuition for the program is $1,099 plus expenses for textbooks, state exam fee, immunizations, PPD, shoes, a watch with a second hand, gait belt, stethoscope, uniform, and classroom supplies. The nurse assistant program at St. Charles is approved by the Missouri Department of Health and Senior Services. The curriculum includes classroom instruction, clinical internship, and final exam, which students must complete for state certification. The program runs year-round and includes instruction in basic nursing skills, safety, communication, infection control, resident rights, and feeding. The average time for completion is approximately 5 months. The classroom instruction is 75 contact hours and is available on a morning or evening schedule. Students must earn an 80% average on all exams to pass the class. Requirements for the classroom session include a copy of FCSR background screening and 2-step TB test. The clinical internship provides 100 hours of training at a skilled nursing facility. Enrollment in the classroom portion does not guarantee clinical placement. Students must pass a urine drug screen and complete at least 50% of the classroom instruction. The shifts for the clinical placement are 8 to 12 hours depending on the day/time. The state exam is administered at St Charles within three months of completing the classroom instruction. Tuition for the program is $375 for the classroom portion, $310 for the clinical internship, and $115 for the final exam. The nurse aide training facilitated by the Delmar Gardens Family is free to those who are hired as a nurse assistant or nurse assistant trainee. Applicants must sign the trainee program agreement to indicate their understanding of the program’s expectations. Graduates are eligible to take the state competency exam and will be promoted to Certified Nursing Assistant and receive a pay increase and bonus. In line with the state’s requirements, the program includes 75 classroom hours and 45 hours of training on the job. Students must maintain good standing as a nursing assistant trainee by attending all classes and showing up on time for their scheduled shifts. 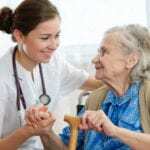 The Certified Nurse Assistant Program at Jefferson College teaches students how to use basic nursing skills to care for residents in a long-term care facility. Graduates are eligible to apply for the State of Missouri nurse aide certification exam. The program includes 75 hours of classroom lectures and 100 hours of supervised clinical practicum at an approved nursing facility. Daytime and nighttime schedules are available. Each session runs for approximately 8 weeks. Applicants must be 18 years or older, pass a criminal background check, pass the BLS course, have a negative drug test, have a current two-step PPD, and provide a copy of their social security card. All applicants must pass the Workkeys Assessment with a minimum score of 3. Tuition for the program is $1,800. The application fee is $125 and required materials cost $290.